September | 2006 | The S.E.E.P. I think that I’ve found my new favorite magazine – the New Internationalist. I clearly need to do more research on the subject, as I need to do more research on CO2 offsetting. Although it seems to be a reasonable interim “patch”, the CO2 market is frought with deception, misperception, and pitfalls. The latest issue of the New Internationalist takes a pretty harsh view of the CO2 offset market. I think that the intention is good and if used properly it could help curb some of our emissions but should not be used as a “liscense to pollute” as some companies are doing. It is a good read so far! We’re in Edinburgh on our honeymoon staying with some fantastically environmentally family. Teachers and philosophers by trade, we sat down tonight to an organic meal made from local produce. They don’t own a car, bike or walk to work, recycle, use cloth napkins! What great new family from across the pond! In just a day we can see how much more environmentally conscious it is here and just in today’s Guardian they told me about a “Green Living” insert. It seems that they started a whole section of their site on “Ethical Living” that includes advice on your home, climate change, energy, your job, food, and hopefully will be full of forward-minded articles. 3. A revenue-neutral CO2 tax – you make more CO2, you pay more taxes. 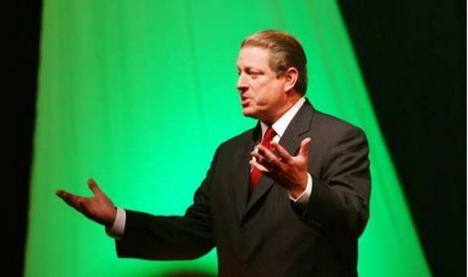 Now all we need to do is implement some of these, go Al Gore! Grist has the entire speech to review. I stumbled across Metaefficient through one of Ideal Bite’s daily tips (They’re fun and informative, by the way). It seems that they review as many ultra-efficient devices and appliances as they can – another good one for our eco-friendly hyperlink arsenal! PG & E Starting Green Energy Program! This following is an official response to one of the posts on my quest to get renewable energy from our energy monoply, PG&E. I’m impressed! It seems that there is a plan in the works, although nobody that you can talk to on the phone or email in the company seems to know about it, they seem to be very interested in making some forward-thinking changes. Checking out their website today, it seems that they have launched a fairly extensive program. Good for you, PG&E! Although I’m sure that this has been in the works for a while, I can only hope that my repeated calls, mails and blog posts have pressured them to open this program to the public. By demanding renewable energy sources and research as individual consumers, we can push energy providers to decrease fossil fuel use and increase innovation. I appreciate your interest in renewable energy for your home. PG&E is aggressively pursuing a program to procure 20% of our customers’ energy supply from renewable energy sources that qualify as Eligible Renewable Resources as determined by the California Energy Commission. In fact, 54% of the energy PG&E supplies its customers comes from carbon-free sources, including PG&E’s large hydroelectric projects and nuclear plant, neither of which count toward the 20% target. Although PG&E does not currently offer its customers the option to purchase 100% green energy, we have designed a new, first of its kind climate neutral power program. We expect approval of this program by December 2006 and we expect to launch the program by Earth Day 2007. The program allows customers to pay a premium to completely eliminate the climate impacts associated with both their electricity and gas use. Unlike traditional green power programs, PG&E’s climate neutral power program uses direct emission reduction credits certified by the highly respected California Climate Action Registry to offset direct emissions. Another difference is that the premium proceeds are invested in new rather than existing projects. The program invests 100% of premium proceeds in greenhouse gas reduction projects located exclusively within California. All reductions are independently verified by a third party certifier and then permanently retired. Most customers are surprised to find that their gas use causes more environmental impacts than their electricity use. The average climate impact of gas use is twice that of electricity use. Another distinction of the new PG&E program is that it will eliminate climate impacts from both electricity and gas use. Other programs that purport to address gas use are using indirect and not direct emission reductions. Not many customers are aware that a third to a half of the carbon emissions associated with electricity use in California were actually emitted out of state. Another distinguishing feature of the new PG&E program is that 100% of the environmental benefits that result from the program will be experienced within California. We will not be funding environmental improvement projects outside of California. For more information about the climate neutral power program, please send an email to CPTpresignup@pge.com. You will receive program updates and can communicate directly with the person who designed the program. If you have any additional questions about PG&E’s procurement efforts with regard to the 20% target for renewable energy, you can email renewableRFO@pge.com and I will respond to you in a timely manner. Thanks Jim, and it’s “Dr. Slaughter”, I didn’t go to 4 years of evil medical school to be called “Mr.”, thank you very much. Will this be the start of a global “call to arms” to save our planet and our race from our self-made fate? Will our attitudes continue to change and advances be made so that we stop the wheels that humans have set in motion? Can we divert our global warming apocalypse? Go California! Lets go Kyoto on those bastards!